introduced for the AM-23 and subsequent weapons. As well as equipping the early jet fighters, the 23mm guns were used for bomber defence. 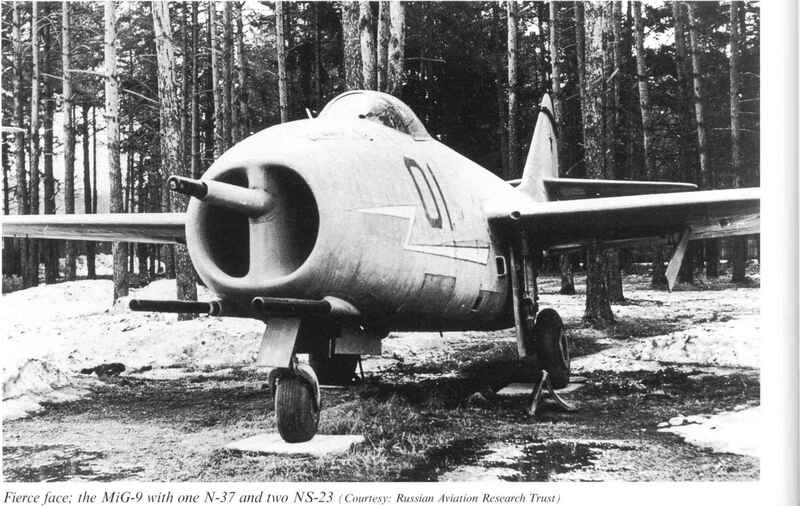 It is not easy to determine which of the several different 23mm guns were used with which aircraft (different marks of some aircraft appeared to use different guns), but it appears that the later versions of the Tu-4 and the 11-28 were equipped with NS-23s (early Tu-4s being fitted with 20mm B-20s), while the Tu-16, M-4 *Bison\ most types of Tu-22 and Tu-95 used NR-23s, as did the An-12 transport. The AM-23 is mentioned in association with versions of the Tu-16, Tu-95, M4 (also known as the M-6 and 3M), 11-54, 11-76, Be-6, Be-12, An-8 and An-12B. 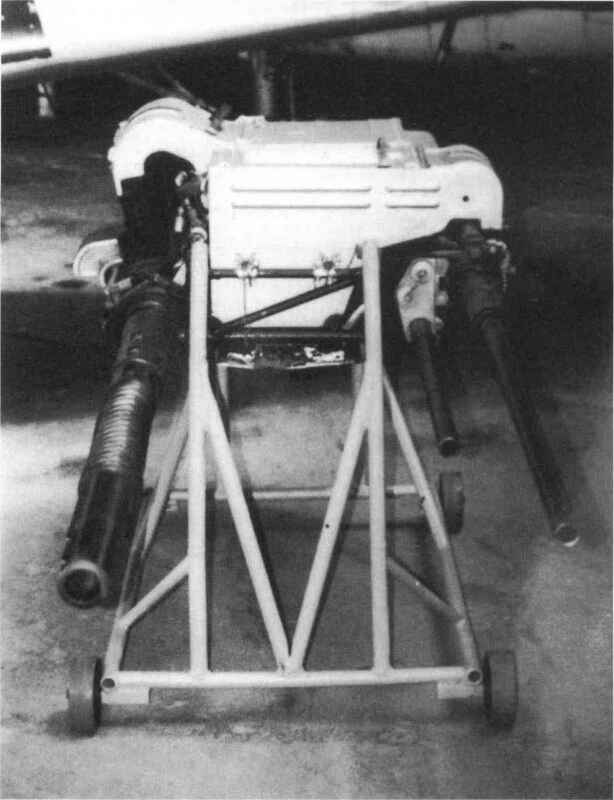 used a 57 x 160 cartridge which was much less powerful than that for the OKB-15-57 airborne antitank gun under development at the end of the war. Rather surprisingly, the Soviet Union also cult to hit the agile Sabres with their slow-firing, low-velocity cannon, a problem exacerbated by inferior gunsights. The introduction of the MiG-15bis and the developed a new aircraft HMG in the early 1950s, MiG-17 in the 1950s saw some improvement in rate the A-12.7, designed by Afanasev. The reasoning of fire, as they were fitted with the NR-23. The real behind this weapon is not obvious as its perfor- answer, however, was to replace the N-37 with a mance was no better than the wartime UB; in fact it weighed the same as the much more powerful faster-firing but still hard-hitting weapon, and this was achieved in the mid-1950s with the introduc-20mm B-20. It saw most use in helicopters and tion of the NR-30 (Nudelman and Rikhter again), fighter-trainers. Like the Americans, the Soviets learned some combination of hitting power and rate of fire and became the standard fighter weapon for some years, being fitted to the MiG-19 (and Chinese-built derivatives), the Sukhoi Su-7 and Su-17 families and some early versions of the Yak-28 and MiG-21 -the 21F (Fishbed-C) and 2IF-13 (Fishbed E). The most remarkable of the 23mm guns was the R-23, a Rikhter-designed revolver cannon which used unique front-loading 23 x 260 ammunition and achieved an impressive 2,500 rpm for a weight of only 58kg. First produced in 1957, it suffered considerable teething problems and was not officially adopted for service until 1963. It appears that it was only used in the DK-20 turret fitted to the Tu-22B and Tu-22K, presumably because the GSh-23 came out in 1959 and offered an even higher rate of fire for a slightly lighter weight, as well as using conventional 23mm ammunition.